This arrived just in time. 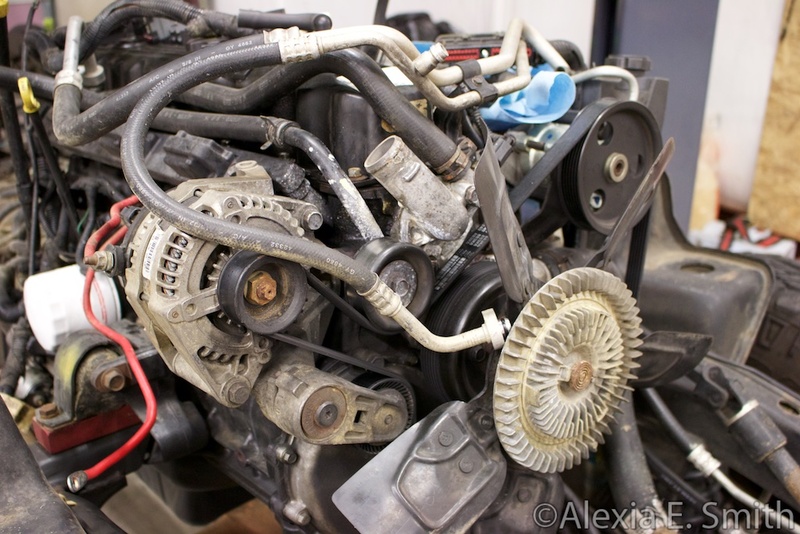 My LJ rolled over 200,000 miles recently and the replacement Chrysler 42RLE has started to slip out of gear. 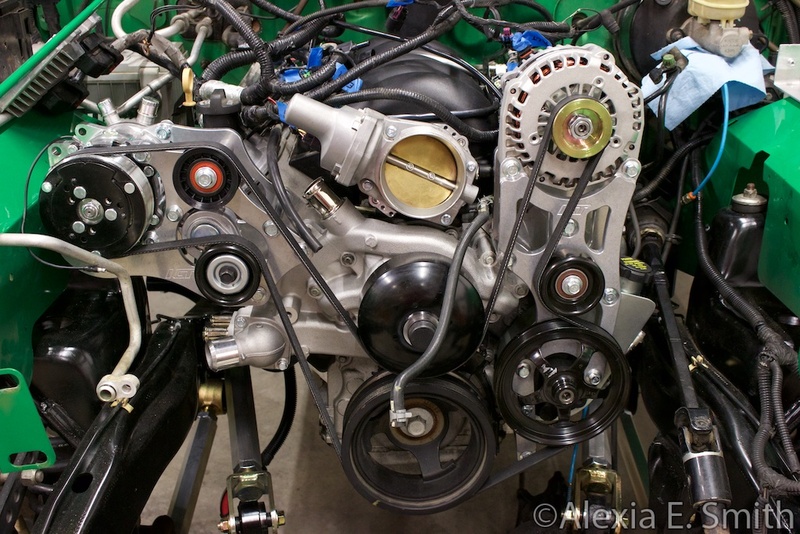 This is a GM L99 6.2L V8 and 6L80 six speed automatic out of a 2011 Chevrolet Camaro SS. The stock 190 horsepower has never been enough so 400+ horsepower should do the job. Just did this exact swap at work in a Scout II and it screams! I would imagine that it ought to scoot around an LJ just fine. 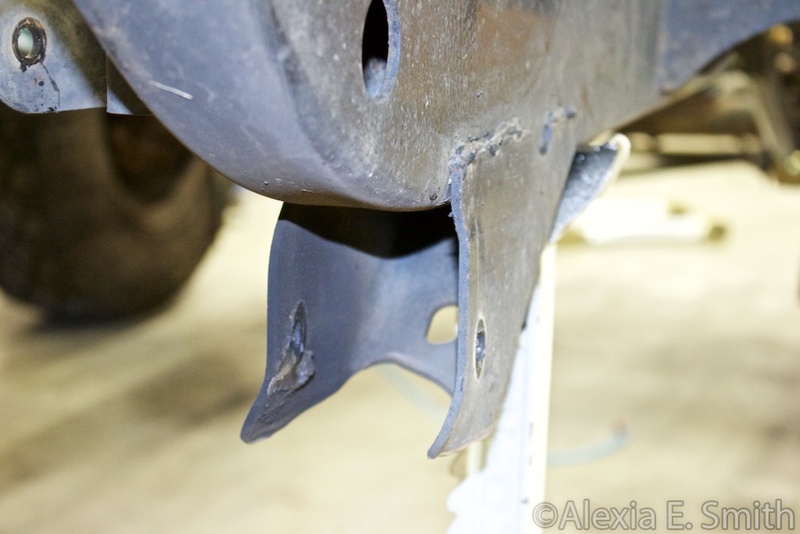 Work of caution: the Scout blew up two Dana 44s without even flinching then was replaced with a custom Currie 60. I picked up a little something to help with the swap and many more projects in the future. I have help coming out this week to install since the columns are ridiculously heavy. 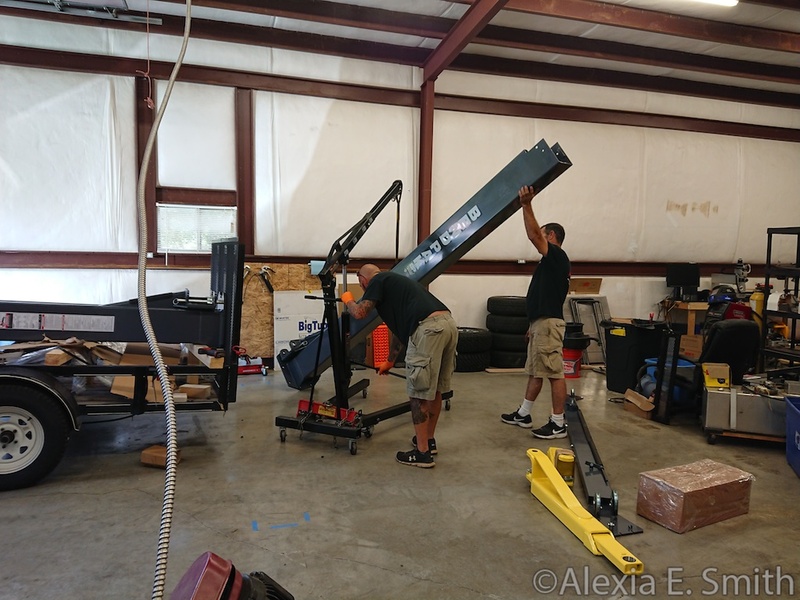 A service company was by yesterday to help get it all installed so I can working on... more shop cleaning! There is still too much crap in the way. 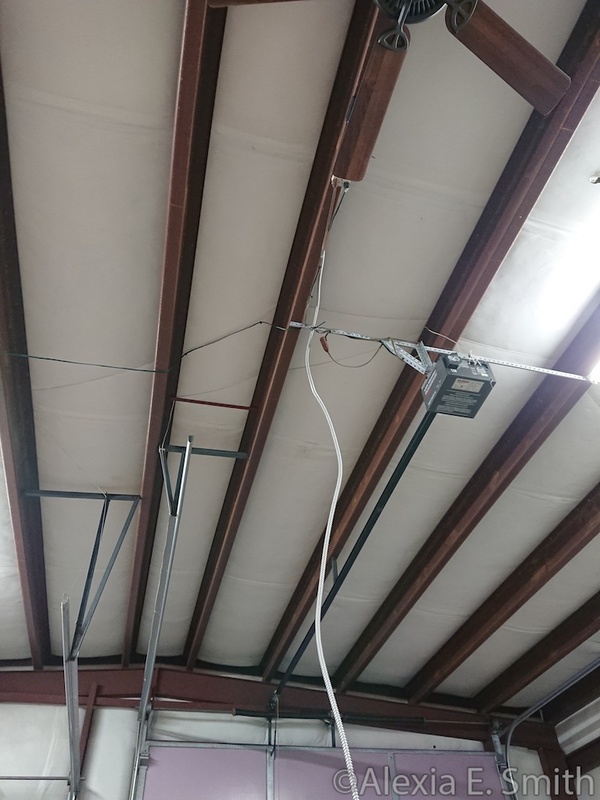 Zip ties are totally kosher wire tie downs. 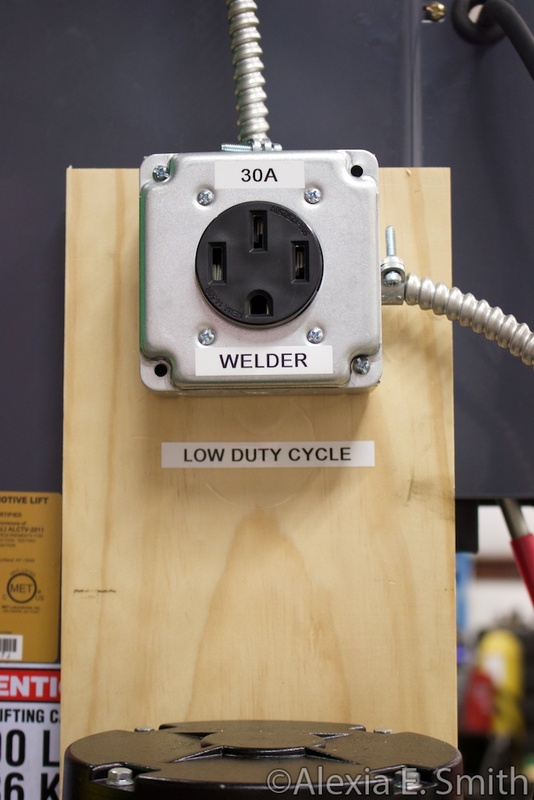 An electrician will be by at some point to rewire the hazards in my shop. I needed the wire ran for the day of the installation appointment. That engine is a beast. Should be interesting to drive! Popping the top off was much easier than expected. 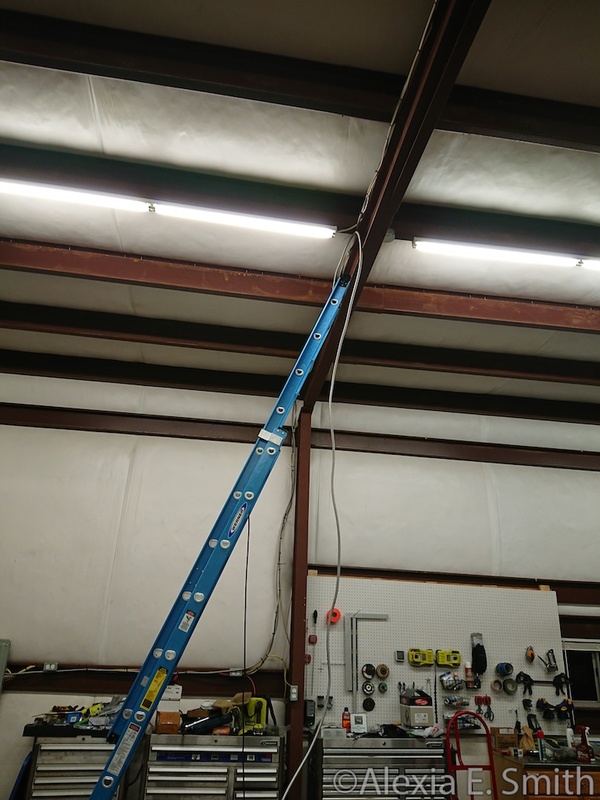 I also wired up the welder hook up on the lift supply. Popping the top off was much easier than expected. My parents were visiting so I basically missed a week working on this. 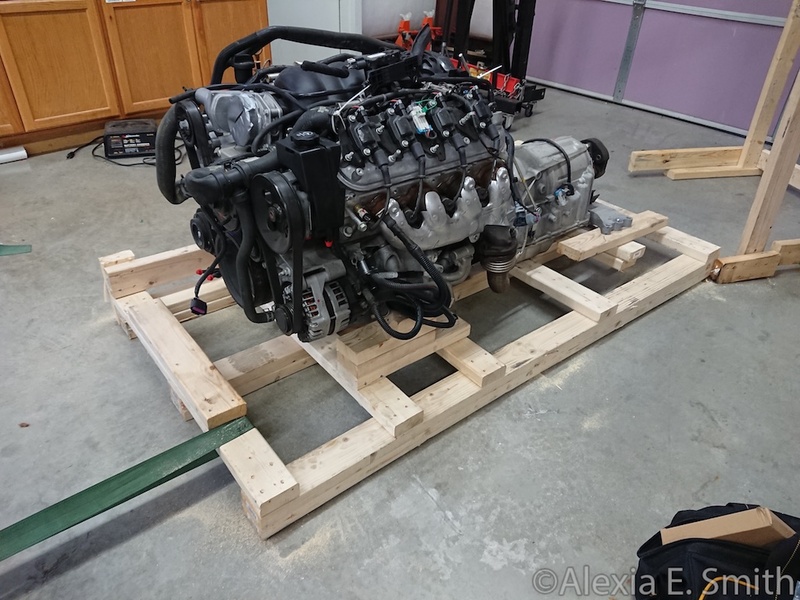 Then I had to come up with a solution to get the engine in there since the engine crane is too short. 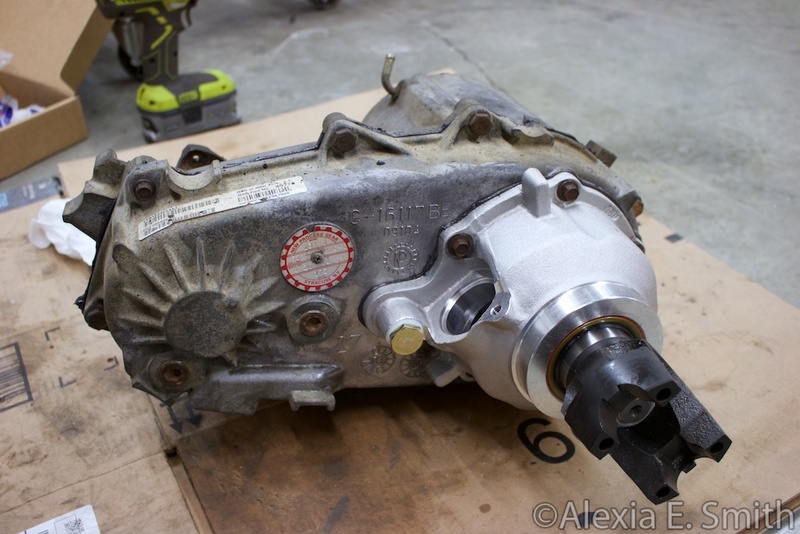 I am also waiting for a few more transfer case parts to arrive so I can finish rebuilding it and putting it on to do a final test fit. The fitment with a 1.25" body lift and the AEV Tummy Tucker is pretty damn good. You are always welcome to come over, but the drive is a bit long. 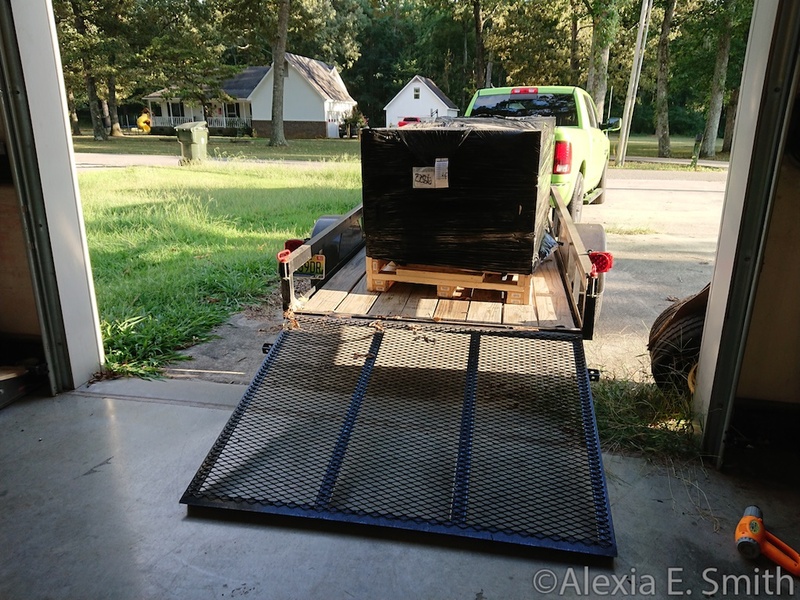 The current road block is waiting for a 4WD output shaft to arrive for the transmission and a giant snap ring plier. 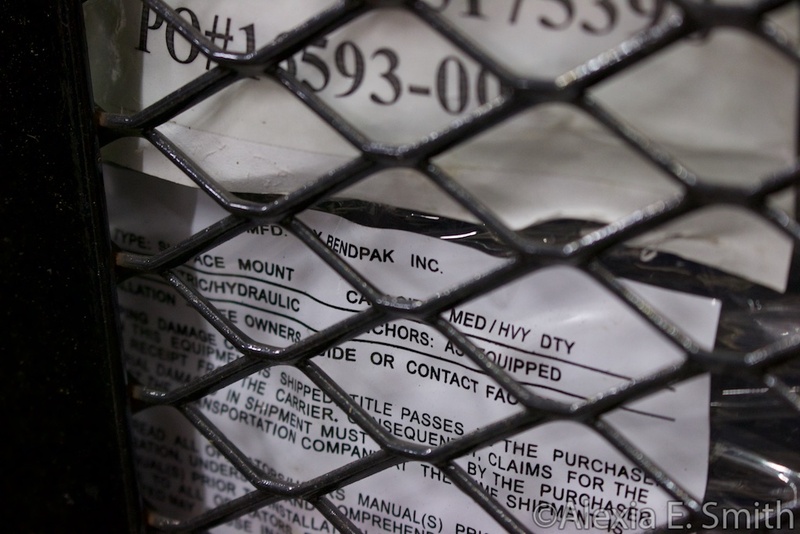 When I bought the transfer case adapter from Novak I only read the part that it was compatible with both 2WD and 4WD 6L80E transmissions. Not the part about that being only the truck versions and not the car version I have. 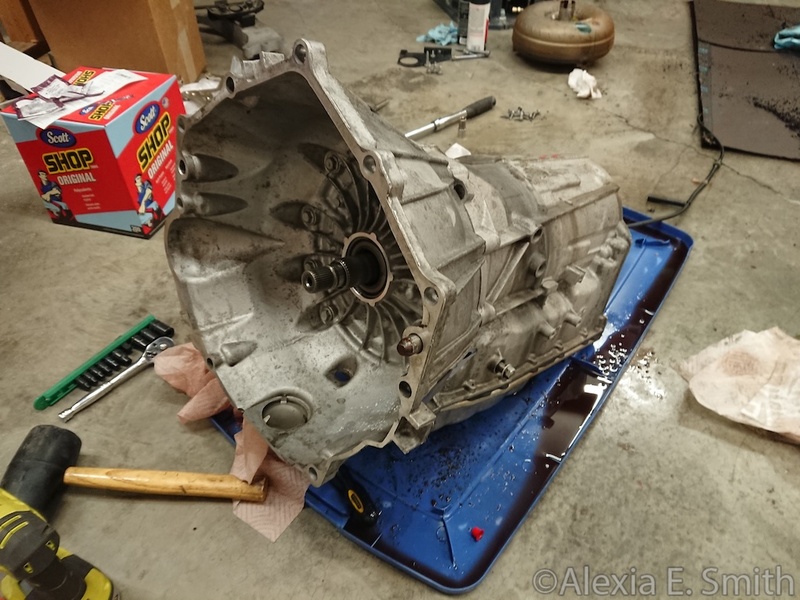 I discovered this while test fitting the partially rebuilt transfer case so now I have to rebuild the transmission as well to replace the output shaft. The Camaro water pump has a bit of a fitment issue. 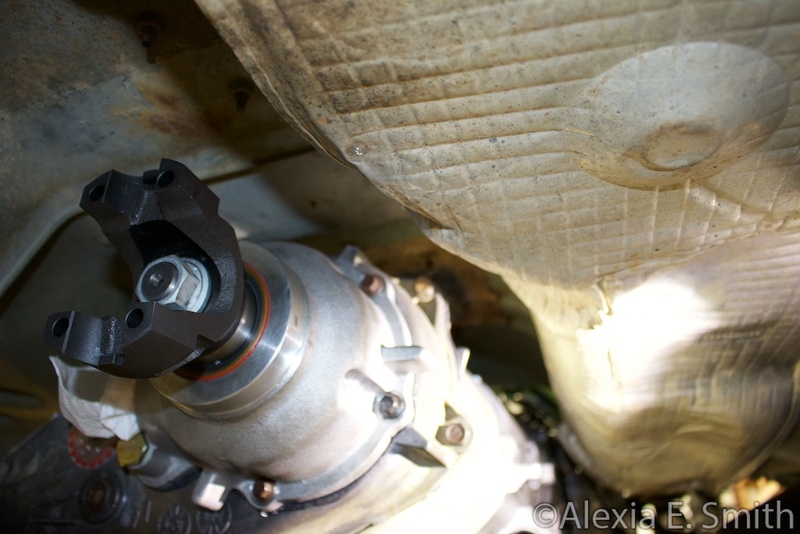 However, I did finish rebuilding the transfer case. New 32 spline input, six gear planetary, and a 32 spline SYE output with a 1350 flange. 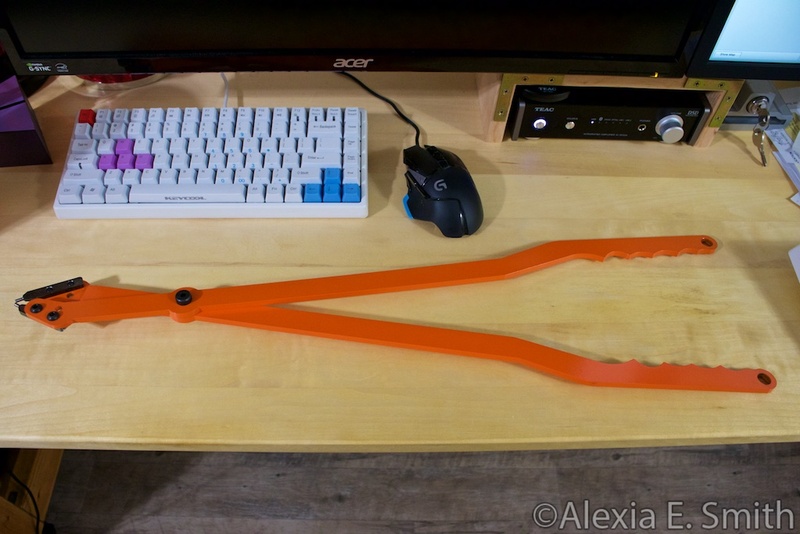 This huge snap ring plier for rebuilding the 6L80 showed up on Thursday. 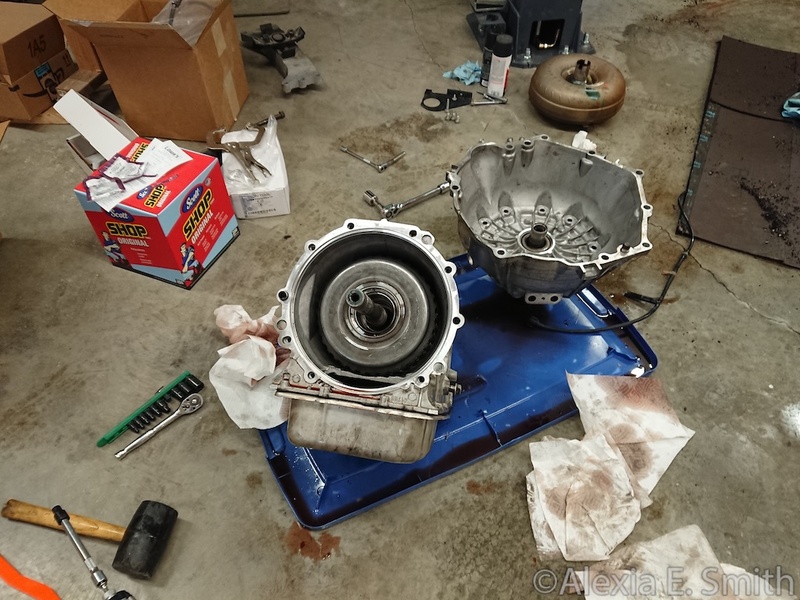 It is the only special tool required to rebuild the transmission and is significantly cheaper than having someone else replace the rear output shaft. 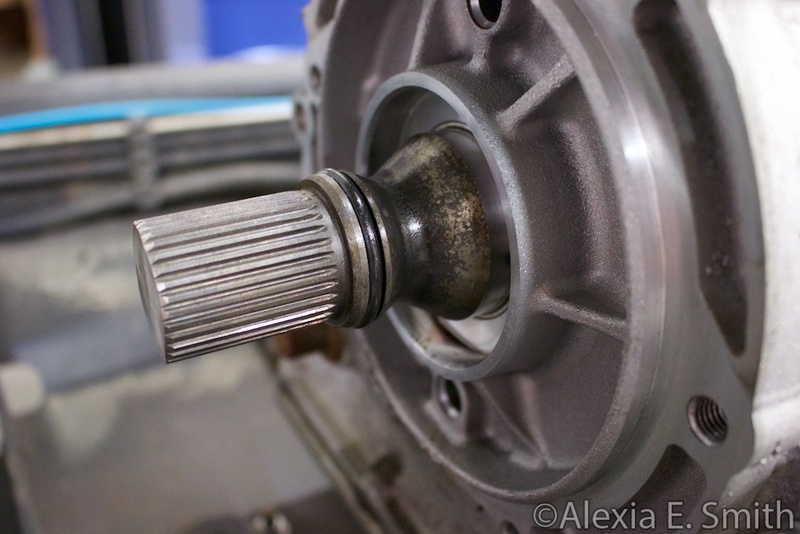 The output shaft on the transmission I need requires splines about another half an inch back. 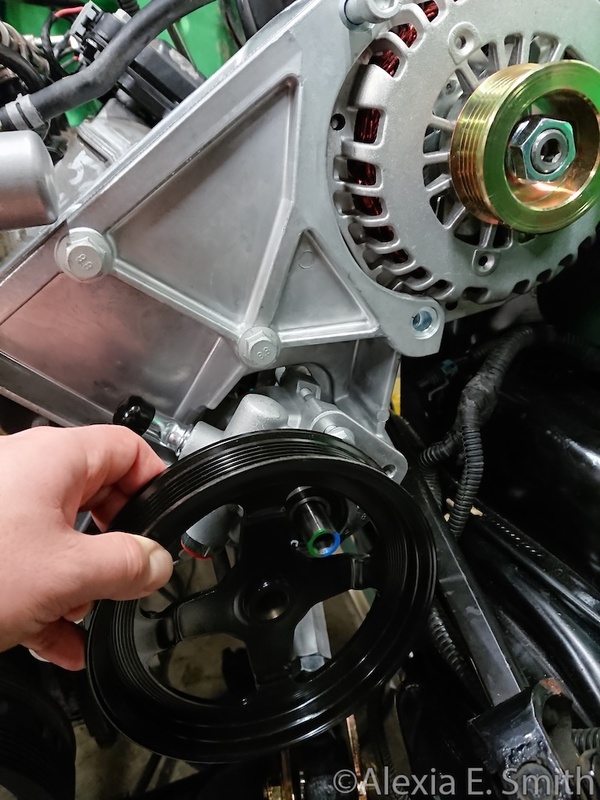 The Camaro output has a milled section for holding an o-ring seal. holy cow! I imagine that's one tool that autozone doesn't have on their loan-a-tool program. 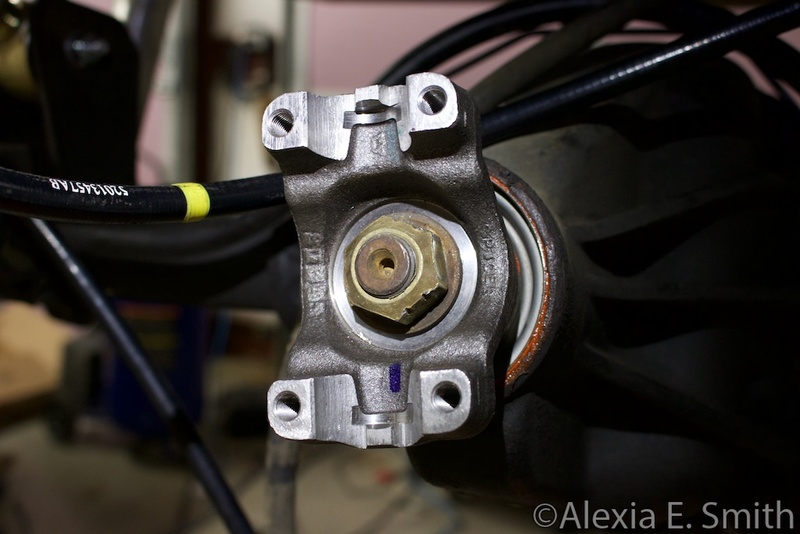 So the solution for the throttle body is to rotate it 180º. More on that later. 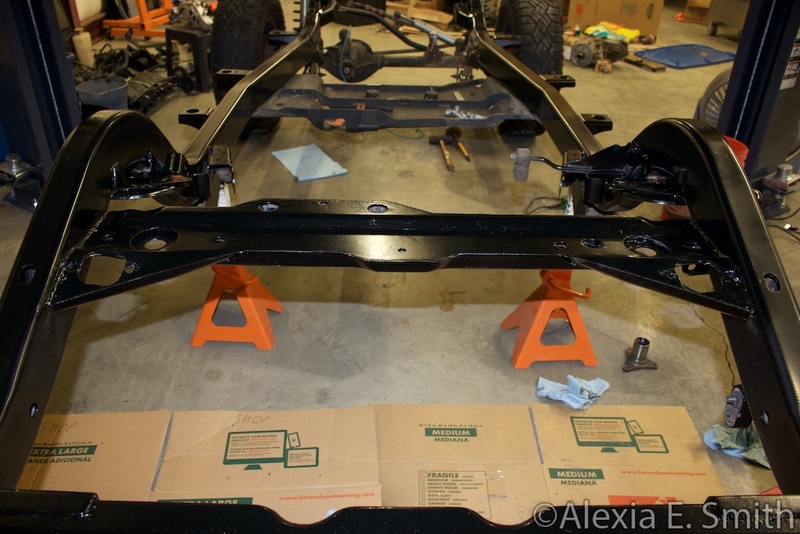 For now I removed the front axle to weld in the engine mounts and paint the frame. 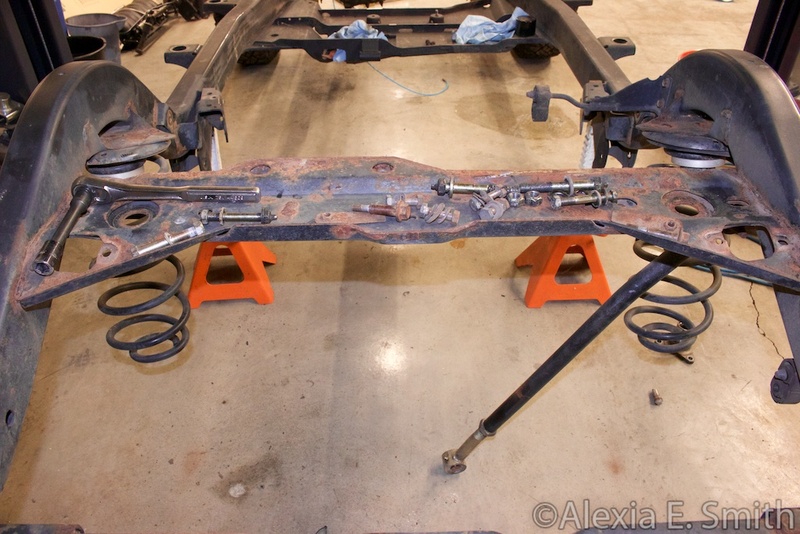 I also have to rebuild the Johnny Joints in the control arms as well. 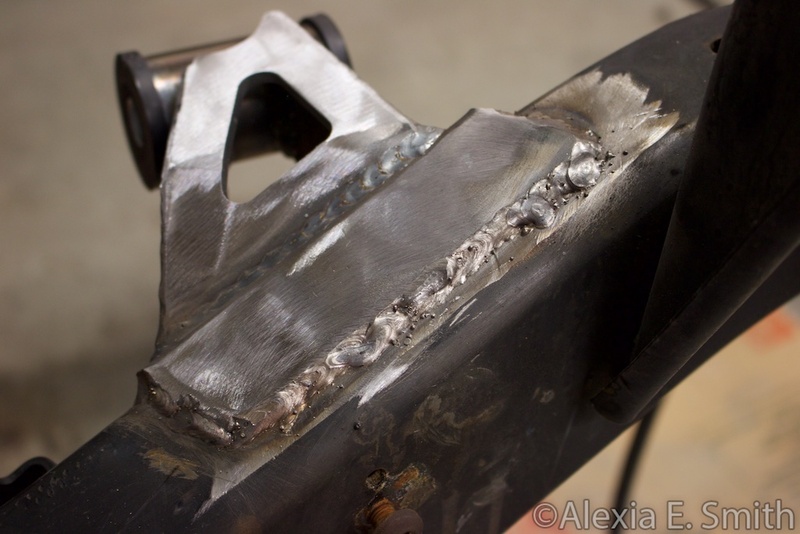 No, the welds are not great. 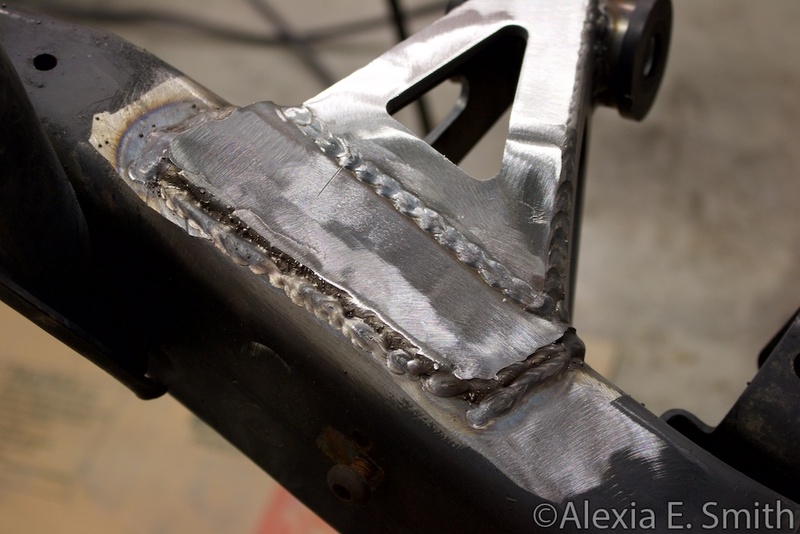 I am still learning and fighting an old welder with a worn out feed lining. 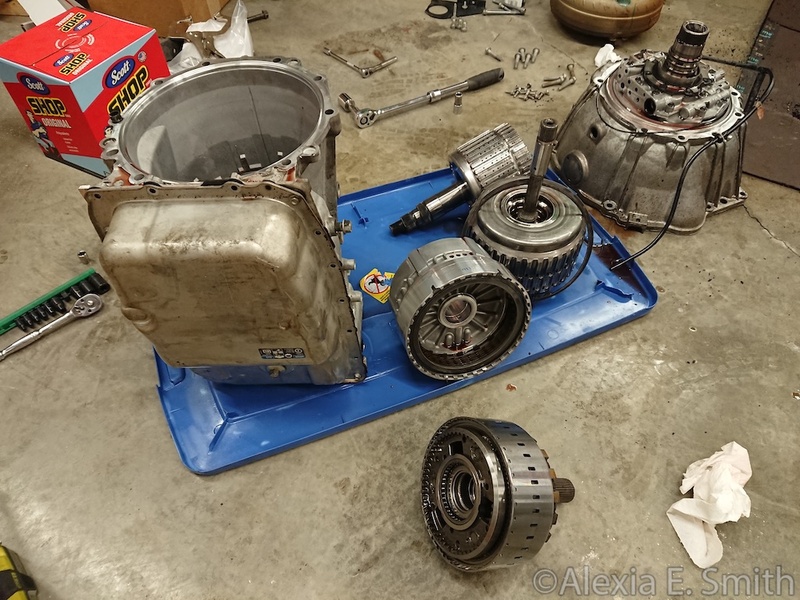 I never rebuild a transmission, but I needed to swap the car 2WD output shaft for a 4WD output shaft along with filling the rear holes in the case. 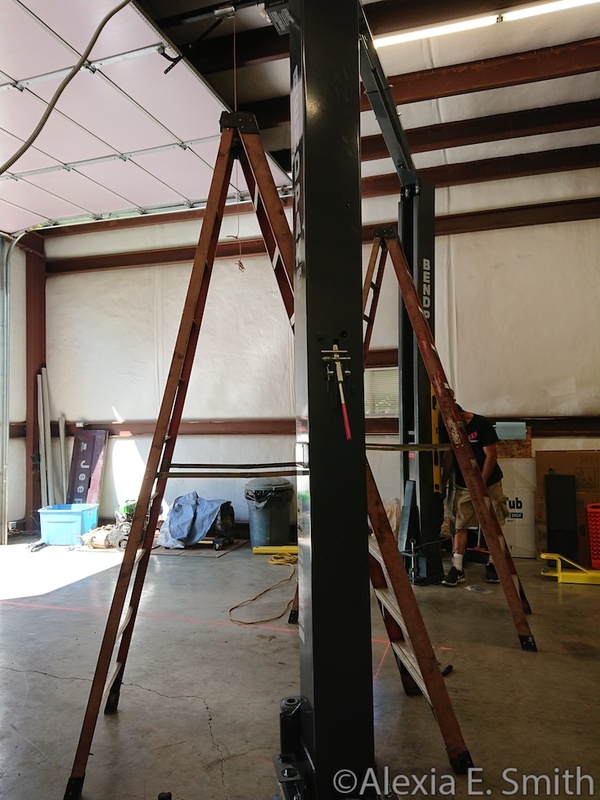 So I rebuilt it on the shop floor. 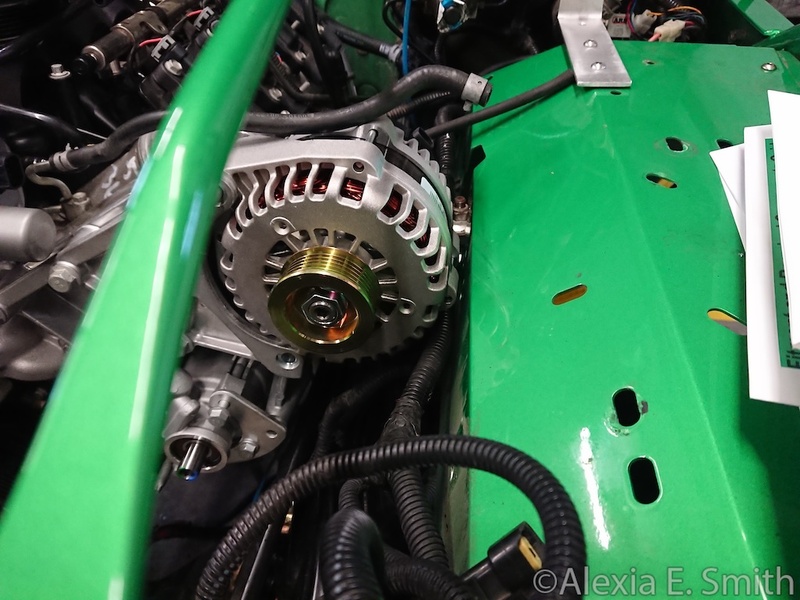 Working on this transmission was really easy and it just requires a bit of attention to detail. 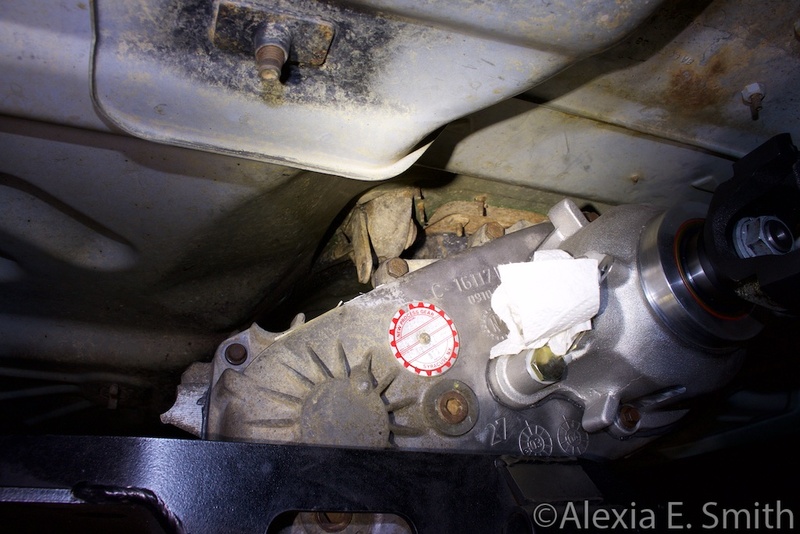 However, getting all of the clutch packs aligned and sunk was a back aching pain. I assume I landed this on a rock at some point. I just have to remember to fix it before painting. The pry bar had to come out to remove the control arm. If you can not see the rust your Jeep is hiding it from you. This lovely tray is perfect at catching and holding debris. 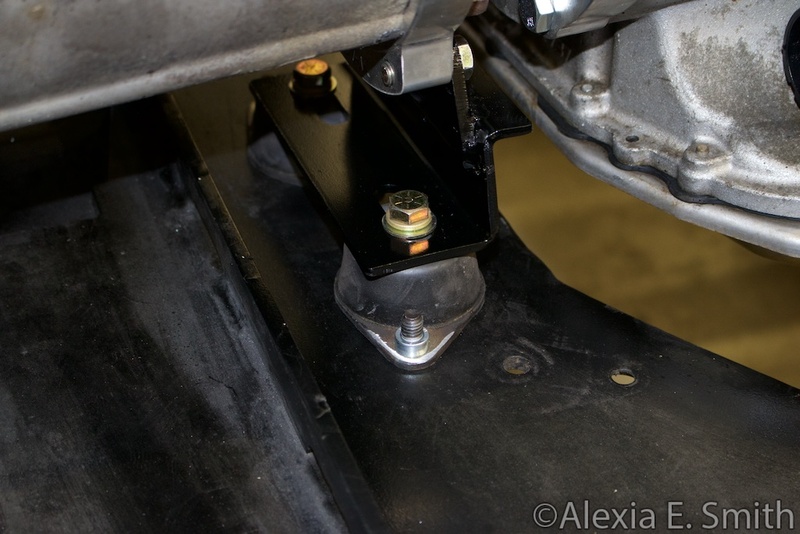 (I forgot to fix that control arm bracket first.) POR15 with a VHT enamel gloss black top coat. 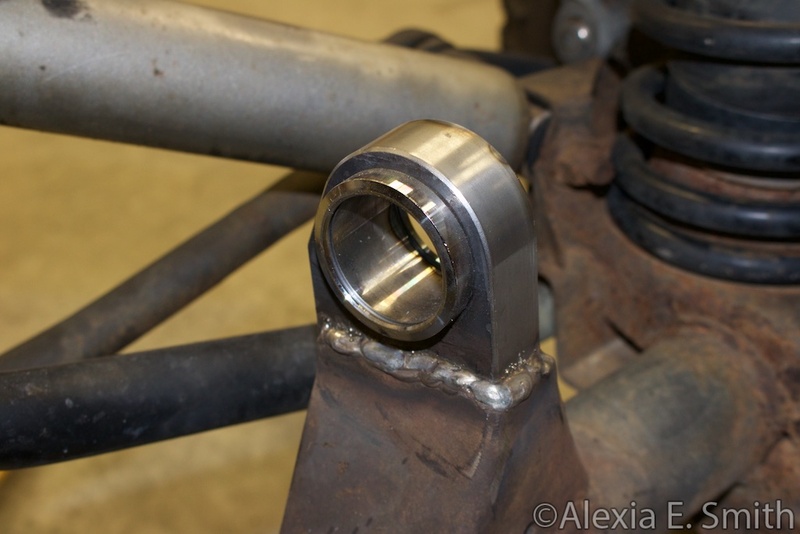 The welded on nuts for the upper shock mounts were air chiselled off a long time ago. 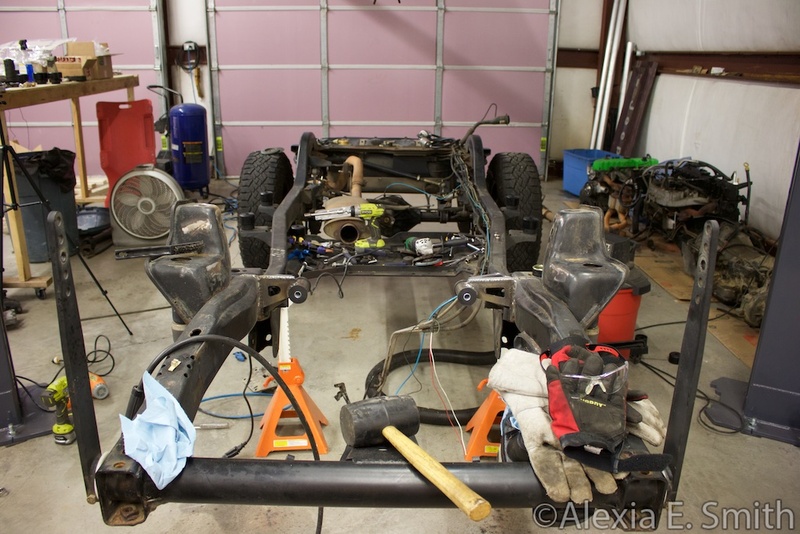 I am installing Metalcloak's Duroflex arms and the front upper arms require modifying the axle slightly to install them. The instructions were brief and best summarized as, "Insert circle into round hole, insert rectangle into slot, weld." 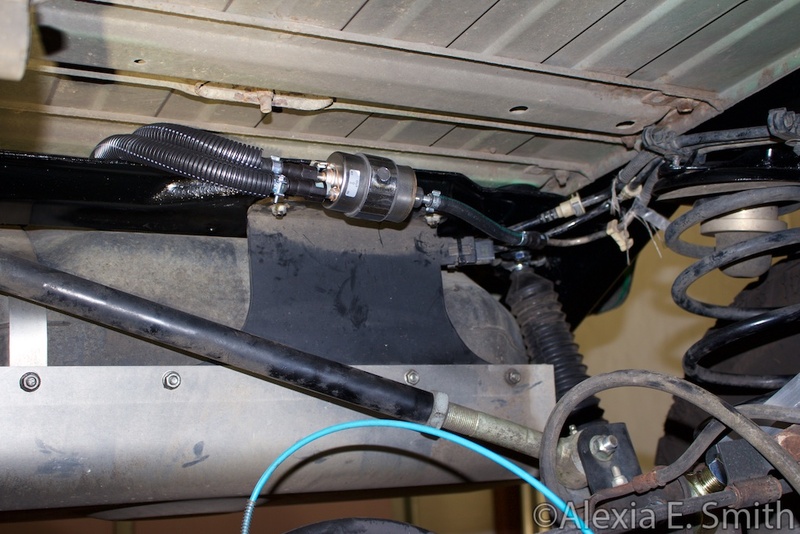 Fuel system? Done. 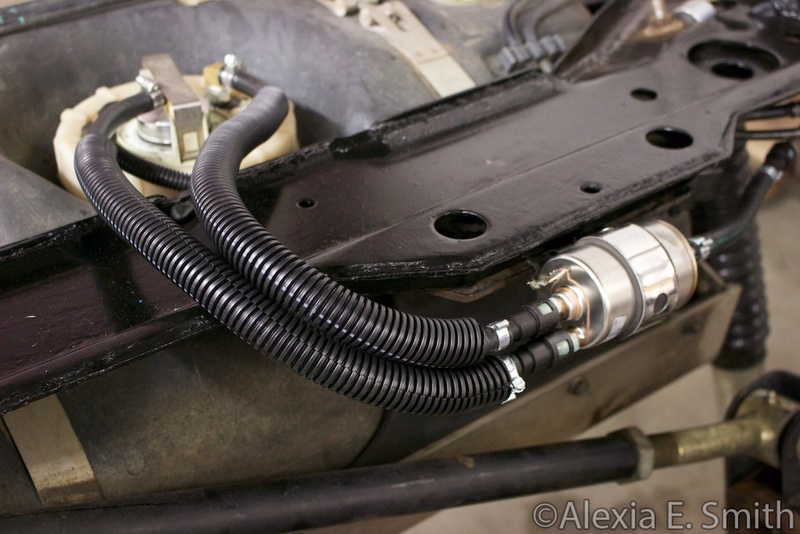 I just need to make a hose from the frame rail connector up to the fuel rail. 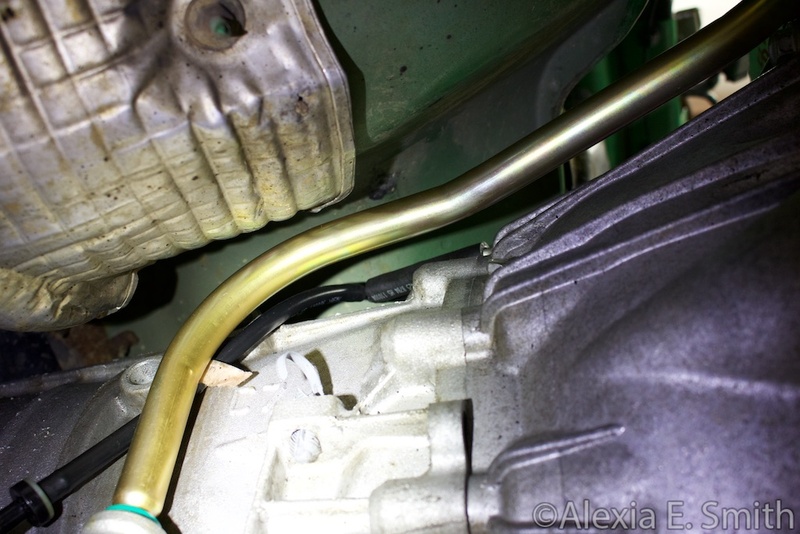 The 4.0L hose is too long and interferes with the exhaust manifold. The front brakes had the typical divot worn out of the caliper knuckle so I fill welded them and ground them square again. 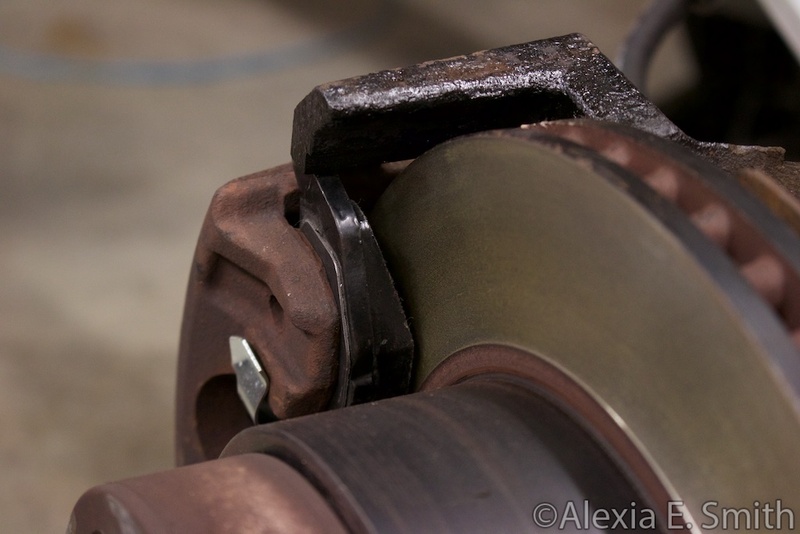 I took brake pads off with 30,000 miles that were lop sided and mostly worn on one side. 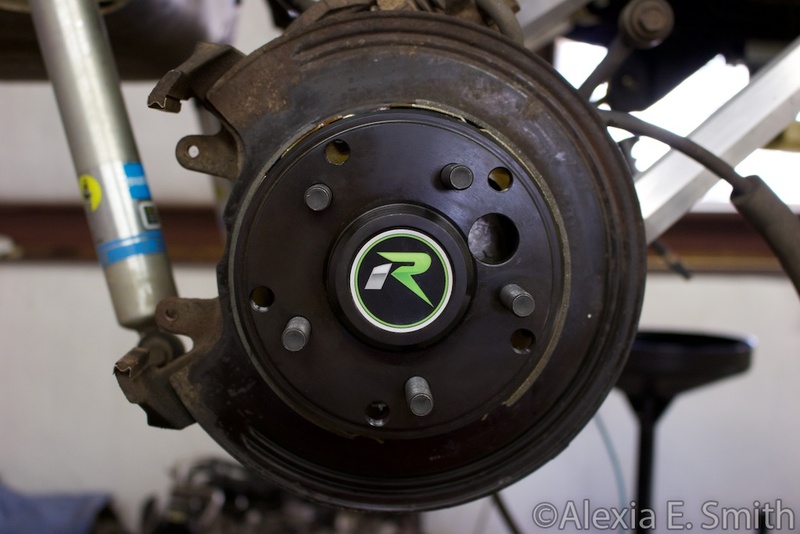 The rotors were still good so I had the local O'Reilly store clean them up. Just some paint for the engine block motor mounts I forgot about for a few months. That is it! 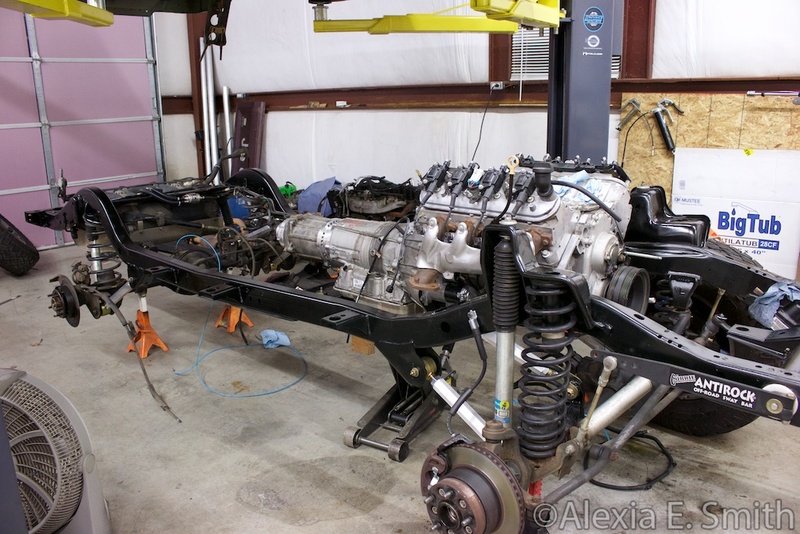 The drive train can stay in and I have folded up the engine crane. 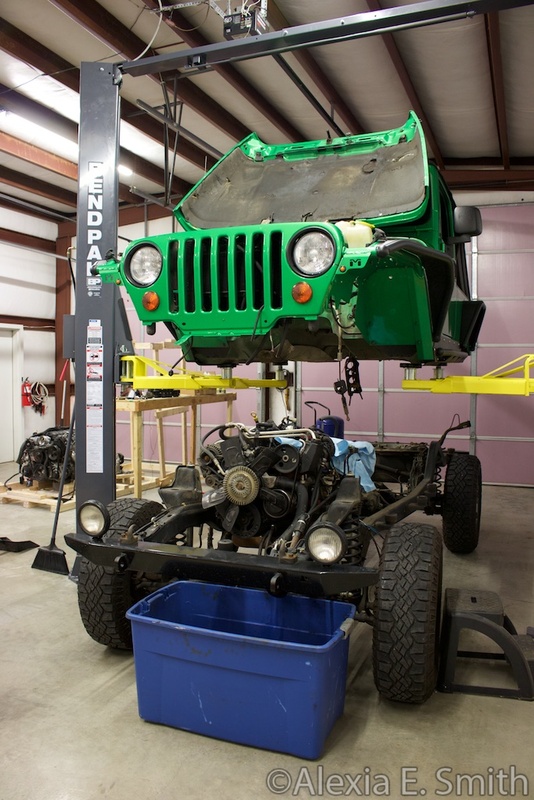 The suspension arms are Metalcloak's aluminum Duroflex arms. 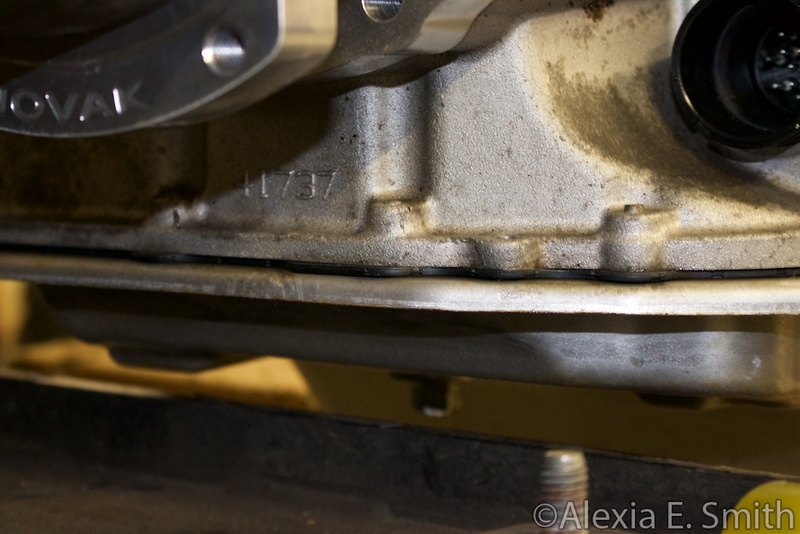 Not a whole lot of clearance between the transmission pan and the AEV Tummy Tucker skid plate. 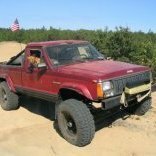 I am going to build the transmission mount as low as possible and then if I have free space after putting the body on I will use spacers to push it up. I own a grinder. 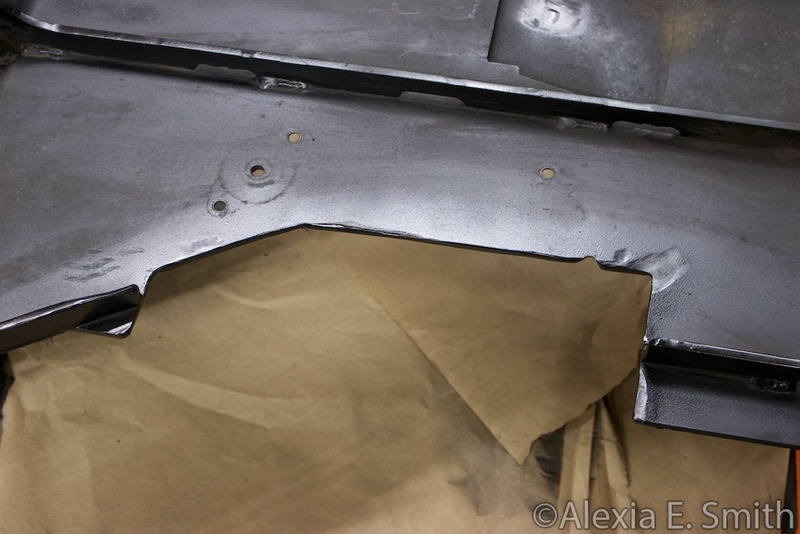 There was no clearance between the top of the transfer case and the floor pan so the transmission needs to go lower. 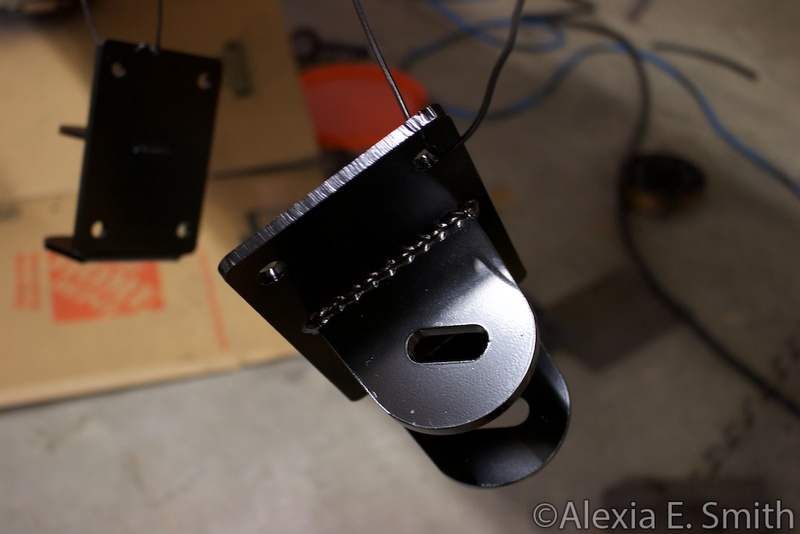 AEV/Nth Degree transmission mounts and the tab off the Novak mount welded to a bracket meant for shipping Dell servers on pallets. 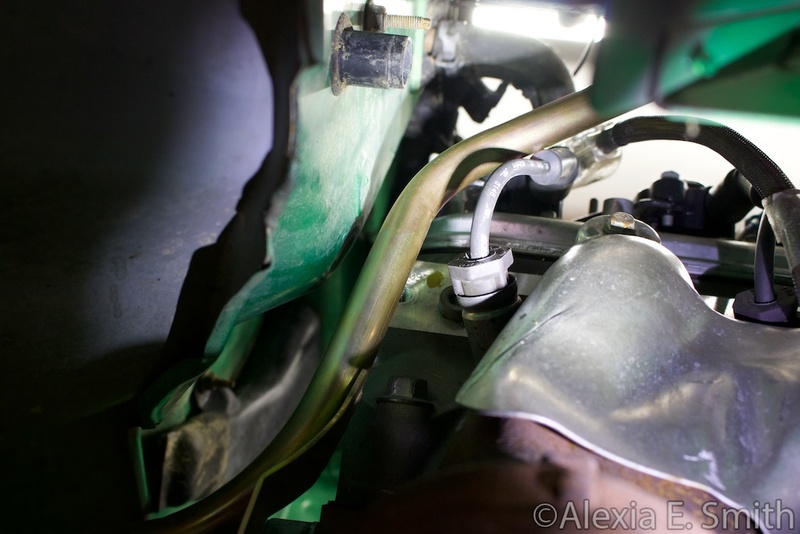 Every motor mount available says that the right side firewall will have to be dented to clear the right cylinder head. Technically I got away with not doing that since it clears due to the Tummy Tucker skid plate, but it was only about 5mm of clearance so I gave it a few taps to get it up to 10mm. "Why don't my brakes work?" 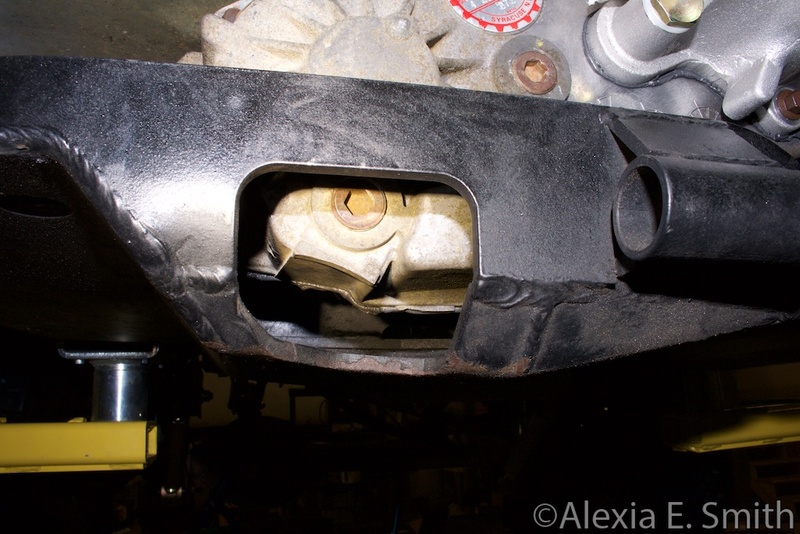 The parking and regular brake pads were entirely covered with differential fluid oil sludge. 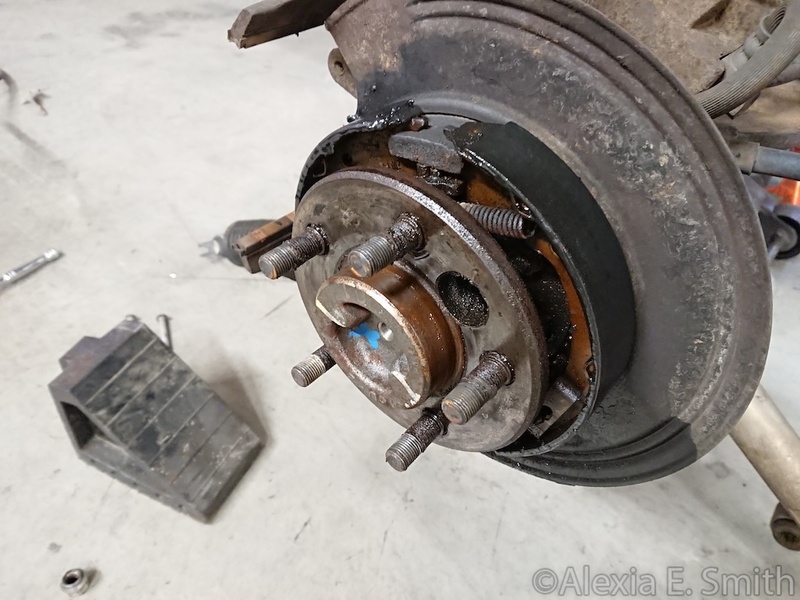 The brake pads also appeared to be a little melted. Replacing pressed on axle seals and bearings is a pain so I bought 4340 chromoly axle shafts with everything already pressed on. 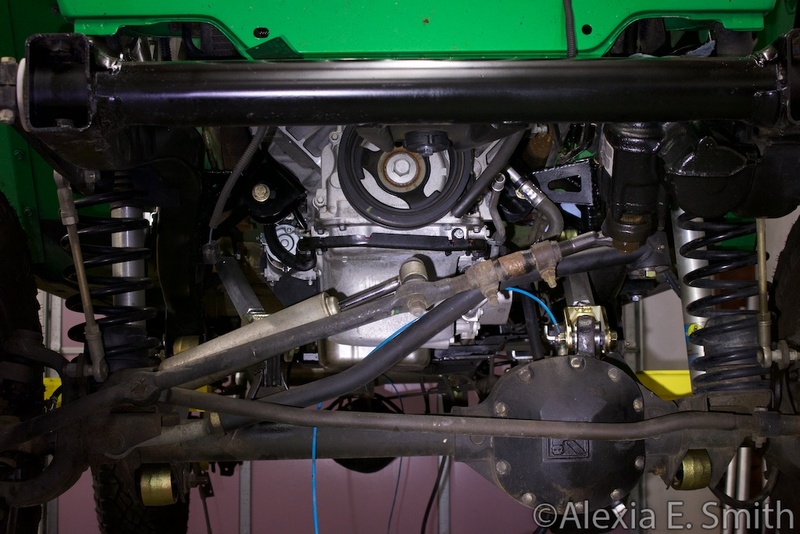 It took me several hours to clean up the mess from the leaking axle shaft seals and get everything reinstalled. 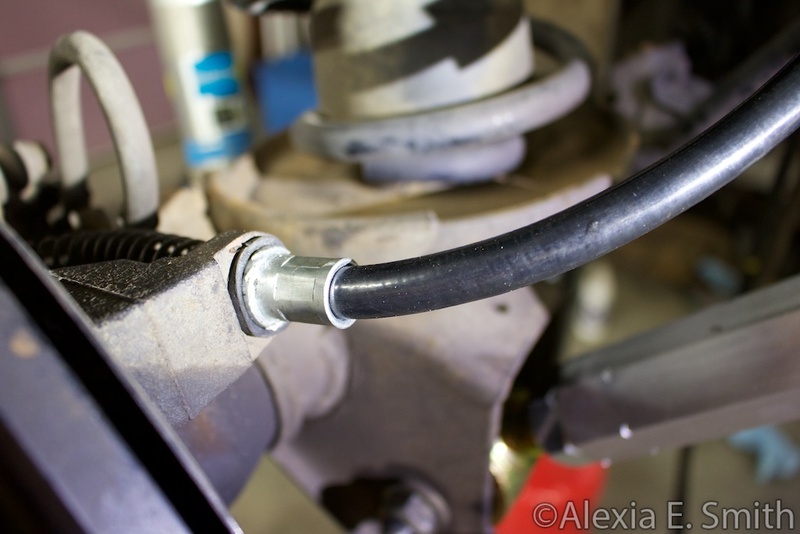 I also installed the replacement parking brake cables from Rugged Ridge. They are high quality junk as expected. 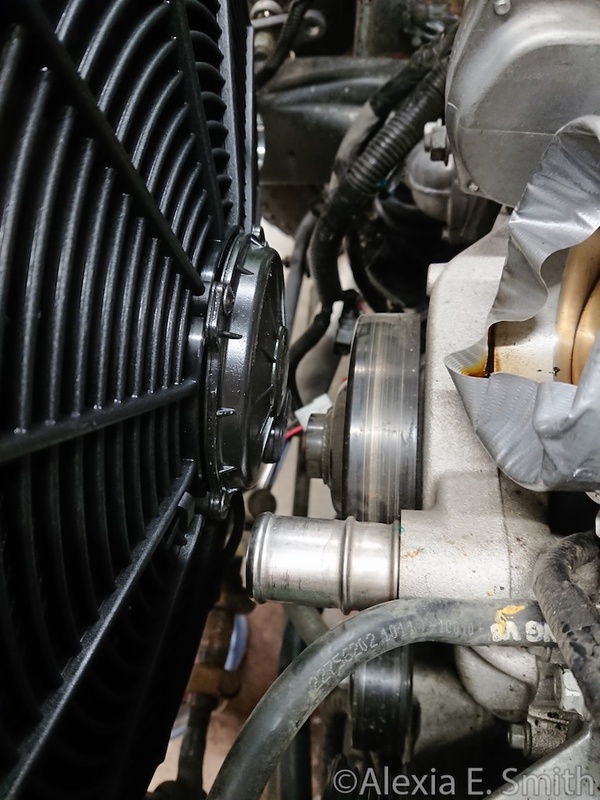 Of course a bigger 1350 input yoke is needed to help handle the extra power. 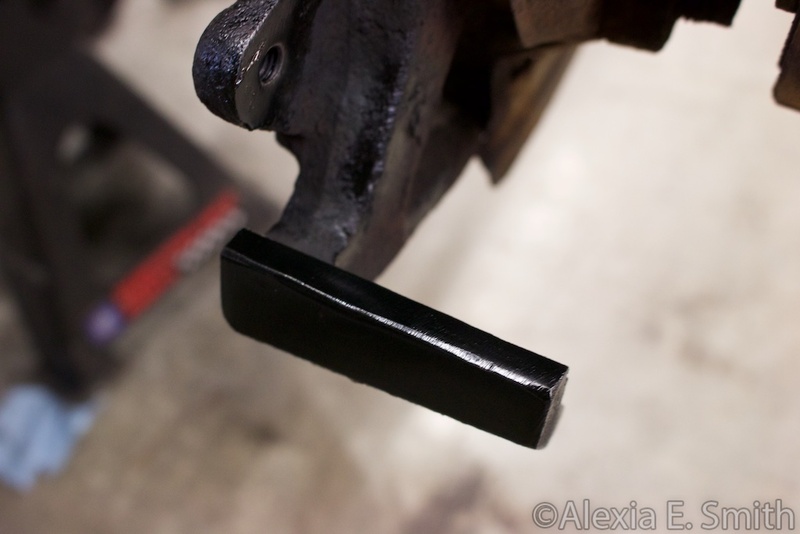 This is actually the stock/commonly used u-joint size for the Camaro. I also got a dipstick tube from JRE meant for people drag racing their Camaros that works perfectly for this drive train swap. The higher up dipstick markings should help with off road shenanigans. 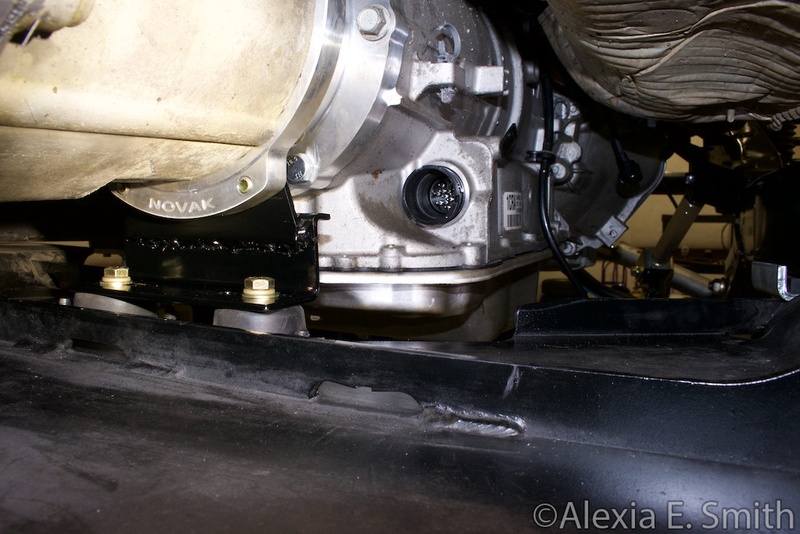 I had a bunch of fitment issues with the Holley engine brackets so I got rid of them for a set of ICT Billet brackets. For reference the belt I used is a 6PK2500. The grill is missing because I dropped it off at my favorite body shop to get repainted due to a large stone hitting it. I have been working on the wiring. 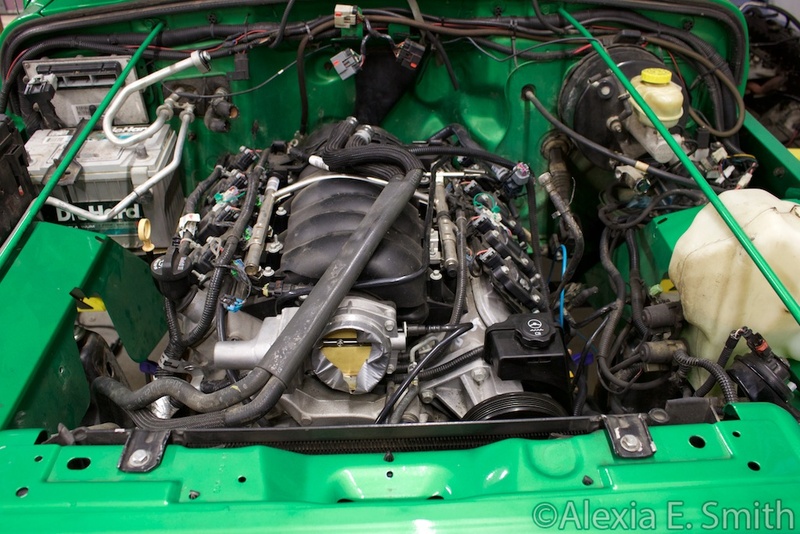 My goal is not add an additional relay/fuse box under the hood for this swap. 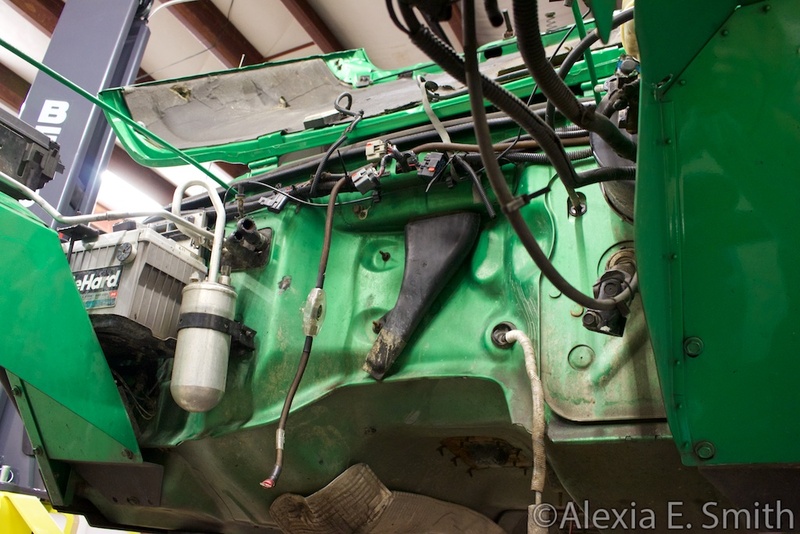 I have determined that it is possible to use the three connectors from the 4.0L engine harness and splice them into the L99 engine harness to utilized the stock Power Distribution Center(PDC). There will be a few wires that need to be added for power and relay control. This spreadsheet details the hook ups so far with some additional work that needs to be completed later as I probe circuits. Thinking outside the (fuse) box: To add circuits to the PDC all I really need are the terminals from another Wrangler's PDC, but sellers only sell the whole harness intact for hundreds of dollars. However, the used, abused, and trashed 4.0L WJ Grand Cherokees with worthless resale use the same style PDC. The eBay sellers just cut the harness off. $30 shipped for a bunch of factory fuse and relay terminals with wire leads in durable plastic packaging.